For the 1996 U.S. Presidential election, the editor proposes finding one who is a model railroader, because many of our skills apply to that job. Where are the entry-level, below-$20, products in S-scale? The author describes how he took two HO-scale building kits and kitbashed them into models representing buildings on his Berg's dairy farm scene. Includes detailed instructions on how to deal with the size difference, accompanied by serveral photos. The author reports on what took place at the 1996 Sixteenth National Narrow Gauge Convention in Durango, Colorado. The event was so large that it required two locations. 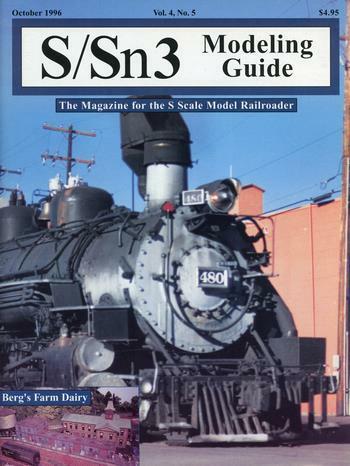 Includes a photo of Doug Jolly's Sn3 Modeler Award-winning "Silver Star Mine" (also won third-place in the Module category). This article covers modeling the New Haven Railway's RPO car, the PRR's B-60 baggage car, the PRR Theater Scenery car, and the New Haven baggage express car. All with photos and construction-detail drawings. How to paint freight car trucks without getting the wheels wet, using a painting mask when using an airbrush. The author takes us through the whole process of tackling an old-fashioned craftsman-style kit. After some detailed prototype history, the author reviews the brass model released by River Raisin. Includes one photo each of the model and the prototype. The author reviews the Hartoy Mack BM tractor and the Fruehauf Aerovan 22' trailer. A thorough review of the Crown Models' reefer car. Tips learned about using tools in our hobby.